Two kisses on the cheek or three? The age-old dilemma may become moot as worries of infectious disease hang in the air. Common forms of greeting, such as handshakes and kisses on the cheek, are coming under scrutiny as the H1N1 virus, commonly known as swine flu, steadily spreads around the world. In Mexico, which has had the largest outbreak of the virus, the Ministry of Health is advising people to avoid shaking hands and kissing people as a greeting. 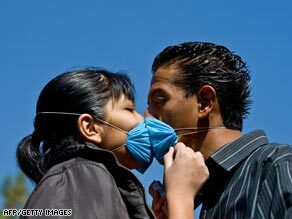 Some couples are donning surgical masks when they kiss to avoid contagion. Dr. Sanjay Gupta, CNN’s chief medical correspondent who has been covering the epidemic from Mexico, is advocating the “el-bump,” or bumping of elbows, as a greeting. “It’s not as cool as the fist bump, but safer,” he wrote on micro-blog site Twitter. Follow Dr. Gupta’s ‘tweets’ Dr. Richard Dawood, medical director of the Fleet Street Travel Clinic in London, refers to the shift in etiquette as “social distancing.” “People don’t want to get too close. There is going to be a move towards less handshaking, less greeting people with a kiss. There may well end up being fewer meetings,” he told CNN. He worries about how people will react as tensions rise. People historically have resorted to socially ostracizing those who have suffered from diseases like typhoid and leprosy, he noted. The flu outbreak will pose another test. “Hopefully we don’t see that again. We will have to control our urges in our relations to other people,” Dawood said.